Olympic bronze-medallist MC Mary Kom feels "discrimination and partiality can kill a sportperson's soul". 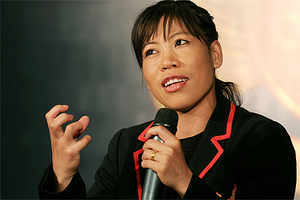 Aizawl, Oct 22 : Olympic bronze-medallist MC Mary Kom feels "discrimination and partiality can kill a sportperson's soul". Speaking at a press conference after a felicitation by the Delhi-based Eternal Partners on Saturday night in the presence of Mizoram chief minister Lal Thanhawla, Mary Kom spoke elaborately on the discrimination faced by sportspersons. "The key to winning Olympic medals is to treat sportspeople equally focusing on honing their talents by providing full facilities and support," she said. The chief minister handed over a demand draft of Rs six lakh to her. Fifty-three other Mizo sportspersons, who excelled in their own disciplines, were also felicitated at the function. Replying to questions, Mary Kom rued being virtually blacked-out by the press in her home state, Manipur, almost throughout her career and being totally ignored even after winning the Olympic bronze medal. "Even after I won the bronze while every national media representatives spoke to me, wrote about my feat, but I failed to get a single call from the press in my own state," she said. "I expected my home state press to share my greatest moment with me, but sadly they did not come forward," she regretted. At the time other states were felicitating their winners with crores, the chief minister of Manipur offered her a cash award of Rs 50 lakh just after she won the medal, which later on was raised to Rs. 75 lakh, she said. She was also critical of the role played by community favoritism which almost took away her chance of entering the Olympic games when another boxer, L Sarita Devi, was chosen despite not making the mark. "I sought a re-trial which clinched it for me," she said. "I had no one to support me as I was the only tribal in a basket full of others of the majority community," she said. Calling Mizoram her 'second home', Mary Kom conducted the press conference in Mizo language.